Surrounded by woods, this one-story summer home built in the 1950’s, sleeps 4 to 6. The Palace’s screened porch overlooks the large, sandy, semi-private beach with dock and floating raft. It’s just a quick hop down to the bottom of the hill to reach the beach. There is a galley kitchen with equipment and dishes for up to 8 (microwave, stove, refrigerator); a large living room with wood stove and queen futon sofa; a small bedroom with new queen memory foam bed; a large bedroom with one double and twin bunk beds; a screened porch; a deck with gas grill; and one bathroom with shower. If you have more than six overnighters, we sometimes have a couple of one-bedroom cabins that can be rented for additional guests. The Palace beach is the best! Great swimming, great sand and sun. You can watch beautiful sunsets from here too. The beach is shared between guests of the Palace and the Point cabins. The small bedroom has queen bed and lots of windows facing the lake. 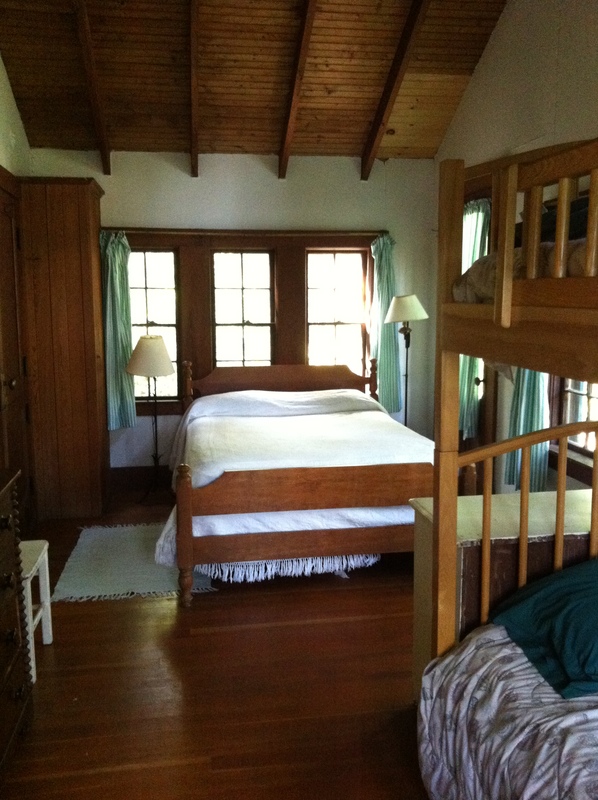 The large bedroom has twin bunk beds and a full bed. Galley kitchen with vintage boomerang style countertops. Living room with tall ceilings. Another view of the large bedroom. Lake-side porch has a swing. The lake side porch with great views of sunsets over the water. The beach is the best on the pond. To check availability and current rates for The Palace please visit our HomeAway site.